We Were Soldiers is the latest in a recent swell of American war films that go beyond the unbridled patriotism of the past with scenes of unparalleled realism on the fields of battle. Beginning with Saving Private Ryan and the more recent Black Hawk Down, Hollywood has focused on thrusting the viewer into the chaos of the central conflict and refuses to let go until the credits roll. 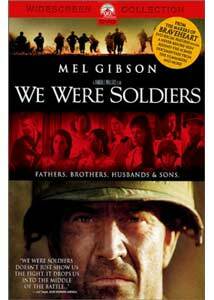 While the brutal assault on the senses that accompanied the opening thirty minutes of Spielberg's war epic were shocking, Randall Wallace's We Were Soldiers may well be even more powerful. Wallace does do a terrific job of showing both sides of the battle, rather than portraying the Viet Cong as nothing more than the faceless enemy. By doing this, the film maintains a tight connection to all its players, giving Moore's character an adversary who is simply doing his job. The battle was neither a victory nor a defeat for either side, which allows the film to make a bold anti-war statement while it simultaneously shows the bravery and dedication of American soldiers. Aside from the stunning visuals and truly developed characters, the performances in We Were Soldiers are perhaps its single greatest asset. Gibson is nothing short of terrific in the lead role, playing a sincere man who must be diligent once the fighting starts. Gibson is beginning to play this sort of role better than anyone else, as proved in the recent, undeniably brilliant Signs, and his work here rivals that of any in his long career in terms of quality. Supporting performances are also very strong; Madeline Stowe, Greg Kinnear, and Sam Elliott each give terrific performances in their limited screen time. Image Transfer Review: Presented in an anamorphic 2.35:1 transfer, We Were Soldiers proves to be a difficult film to grade based on the documentary style that the film features. The overly grainy look by cinematographer Dean Semler seems identical to the print I saw in theaters, but others may consider this a flaw. Sharpness and detail are perfect, though the scenes set in Georgia do offer a softer look than those set on the brightly lit battlefields. Colors are rendered perfectly; the harsh blues at the outset of the film look just as good as the greens and tans of the battle sequences. Overall, this is a fine transfer, taking into account the intentional look. Audio Transfer Review: The Dolby Digital 5.1 EX mix is reference quality, gloriously enveloping the room with special effects and explosions, keeping nearly every speaker continuously active. Directionality is terrific as the mix recreates the ambience and chaos of battle, all the while offering natural sounds as well. Dialogue is crisp and clear, while the .1 LFE track offers some serious low end action. Extras Review: A commentary by writer/director Randall Wallace leads off a short, but thorough list of extra features. The track is informative in the way that the director covers nearly every aspect of the production in a detailed yet interesting manner. From his praise of his cast to the way his editor and cinematographer helped in creating effective sequences, with this track, Wallace proves to be one of the better commentators that I have ever heard, especially when discussing the differences between novel and film. He also discusses what had to be trimmed for the script in order to make a compelling picture. A selection of ten deleted scenes are offered and many are rightfully cut from the finished feature, including a fight between Kinnear and another pilot. One scene—quite informative and one I feel adds a sense of closure missing from the final cut—involves Moore discussing the battle with the Secretary of Defense, claiming that there was no victor; that his opposition fought just as hard and believed in their cause as much as the American forces did. These scenes are also available with commentary by Wallace. We Were Soldiers may well land in the top ten films I have seen this year. It is both horrifying in its depiction of war and touching when focused on the human condition, a stunning achievement for the genre. Highly recommended.